While troop-contributing countries have been fed a steady diet of the excesses committed by the Taliban, many thousands of Afghan civilians have had to endure untold suffering through error, ignorance, negligence and over-reach of the international military forces sent in to create security and stability in the country. The elderly man climbed slowly to the podium at a press conference organized by Amnesty International. On his head was a large black turban with a strip of cloth hanging from the side in the fashion typical of the area of the country he had travelled from -- a remote province in southeastern Afghanistan. His voice however was firm and clear as he recounted the tragedy that brought him to this moment. In September 2012 a group of women and girls from his village were collecting firewood when an American military plane dropped at least two bombs on them, killing seven, including his 16-year old daughter, Bibi Halimi. The U.S. however, denied all culpability in the attack, claiming instead it was insurgents that had been killed. And so Bibi Halimi's father, as well as the families of the other six victims, were left with only questions as to why their loved ones had needlessly died. "I have no power to ask why the international forces why they did this," he said. "I can't bring them to court." The story came to light yesterday in Kabul, where the press conference was held. Bibi Halimi's father and other civilian victims of international military operations had the opportunity to have their voices heard even though they will never see justice served or receive compensation for their losses. As documented in Amnesty's report, Left in the Dark. 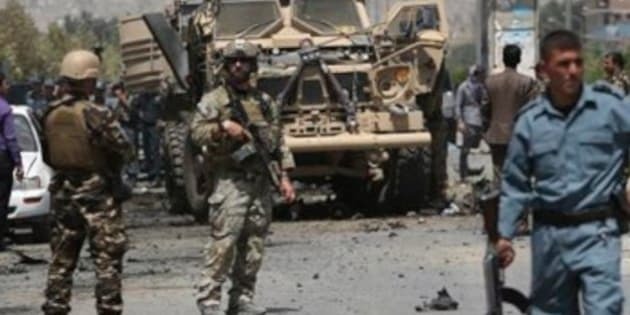 Failures of Accountability for Civilian Casualties Caused by International Military Operations in Afghanistan, thousands of innocent Afghans have been killed and thousands more injured by International Security Assistance Forces (ISAF) since 2001. Very few incidents have been investigated, and even fewer punished. While troop-contributing countries have been fed a steady diet of the excesses committed by the Taliban, many thousands of Afghan civilians have had to endure untold suffering through error, ignorance, negligence and over-reach of the international military forces sent in to create security and stability in the country. These types of incidents and the loss of life and livelihoods that go with it are euphemistically known as "collateral damage." Sad, but then war is hell. It's called collateral damage for a reason -- the scrubbing clean all vestiges of the human tragedy that lies behind the euphemism. What has been hidden from the glare of the media spotlight is the reality that complaints about indiscriminate killings of civilians by international forces have little value. They are immune from Afghan legal processes even though some would fit the legal definition of a war crime. And the militaries accused of such atrocities seem immune to the pain and loss of life their operations have inflicted. As the Amnesty report documents through case studies, international forces have systematically failed to address this issue. Out of 1800 indiscriminate or deliberate deaths caused by international military operations between 2009 and 2013, only six cases have been criminally prosecuted. The report points to structural failures within military justice that hinder the investigation and prosecution of crimes against civilians. International forces operate in an environment of 'self-policing' and troops have little incentive to report incidents of civilian killings up the chain of command. It's the dirty secret of the international community's 12-year military engagement in Afghanistan. Although the report focuses on U.S. military abuses, since they comprised the largest majority of international forces in Afghanistan, the report notes that civilian casualties were caused by military operations of other troop contributing countries. When asked about the report the American Ambassador to Afghanistan noted that "Afghan civilians are being killed all over the country by the Taliban every day in unfortunately large numbers. In any discussion of civilian casualties, that's where the focus should be in my view." In response, Amnesty commented that it was "a shame that the U.S. is comparing itself to the Taliban. America acts as the global policeman for human rights and now they're assessing their actions in relation to a group that does not hesitate to resort to extreme violence and violations of people's rights." After the press conference, the father of Bibi Halimi asked for a copy of the report. Only English ones were left. It didn't matter that he didn't understand the language. He simply wanted a copy for the picture on the cover of the report. It was a photo of his daughter laid out in the back of a vehicle on the way to the hospital morgue, her death still fresh, although in the image she looks peacefully asleep. I sit here writing this with the picture of the teenage girl next to me, her life senselessly cut short by the very people sent to her country to protect her, and the image of her father on the podium telling their story seared into my memory. To know that this father will never receive any answers, any reckoning by those who caused his daughter's is a bitter pill to swallow for those of us who believe in justice and accountability. With the prisoner transfer scandal still fresh in Canadian minds, it's a lesson we need to heed for the next international military effort that Canada agrees to participate in.